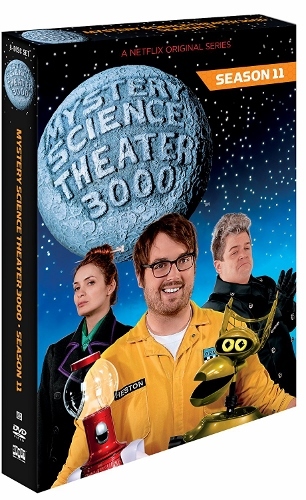 TV on DVD: "Mystery Science Theater 3000: The Return"
It’s been nearly twenty years ago since ”Mystery Science Theater 3000″ graced the television airwaves and now it’s back! It was nearly thirty years ago when Joel Hodgson brought his little “cow-town puppet show”, Mystery Science Theater 3000, to the Comedy Channel (later Comedy Central). After ten years split between Comedy Central and the Sci-Fi Channel, the show was cancelled, presumably forever. The cast all went their separate ways, but some did later return for similar projects, such as Hodgson’s Cinematic Titanic and Rifftrax, headed up by head writer and performer Michael J. Nelson. Fans of the show were intrigued when Hodgson appeared on Kickstarter wanting to raise money to bring the show back. The Kickstarter ended up earning over 6 million dollars in donations. Interest was definitely there, so Netflix decided to carry the new episodes, dubbed Mystery Science Theater: The Return (or Season 11). The show has subsequently been released on DVD and Blu-Ray from Shout!Factory (who liked MST3K so much they literally bought the company). Fans of the show were concerned when we heard that it was going to be totally recast, both with known performers (Jonah Ray, Felicia Day and Patton Oswalt) and relative unknowns Baron Vaughn, Hampton Yount, and Rebecca Hanson. Could Hodgson and Company make the magic happen again? I’ll tell you what I liked and didn’t like about it. First of all, it was encouraging to see show creator Joel Hodgson at the helm again. It made you feel confident that any changes from the original formula took place with his blessing. It seemed that everybody that was there was a fan of the original show, and wanted it to succeeed this time too. It’s also good to see that there’s still no shortage of cheesy movies to work with, and they focused mainly on giant monsters and science fiction this time, a genre that the show knows very well (although there was still room for a Hercules movie, some “whimsical” fantasy, and a talking monkey). We also had some great cameos from big time guest stars like Neil Patrick Harris, Joel MacHale, Mark Hamill, Jerry Seinfeld, and even Hodgson himself. As great as the shows were, I still think there are spots where they could improve. For example, there really seemed to be too many riffs going on at times. They need to learn when to step back and let the movie breathe a little. Also, Hodgson mentioned that Vaughn and Yount hadn’t really had a chance to learn the puppeteering, so there were other people operating Crow and Servo. I also heard that the performers pre-recorded their riffs in a recording studio instead of doing them “live” on camera. Sometimes this made for a disconnect and lost some of the spontaneity that the original show had. And while it was fun to have all the guest stars, they were nearly all filmed separately and cut into the scenes instead of appearing in the same scene with the actors. Lastly, they occasionally resorted to a pet peeve of mine, the dreaded “wigglecam,” where the camera moves around a little bit to provide motion in an otherwise still shot. I thought I’d conclude with mentioning a couple of my favorite episodes. One of them was the season opener, Reptilicus, a giant monster movie from Denmark. I think part of it was the “new car smell” of just having the show back again, as well as having what was arguably the best song of the season, “Every Monster Has a Country”. I also enjoyed Carnival Magic, a cheapo kid’s movie featuring the aforementioned talking monkey. And since I have a special fondness for Christmas movies, I liked The Christmas That Almost Wasn’t, which gets extra love from me because my name is listed in the end credits. The DVD also includes a documentary about the history of the show and how this new incarnation came to be, with interviews and behind-the-scenes footage from the cast and crew. 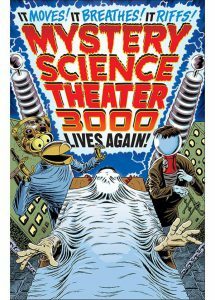 As with just about anything MST3K related, this comes highly recommended by me. It’ll also give you something to do while we wait for the next season of the show, coming soon!